What do I do to cool off and relax between burning up the keyboard trying to get DESTINED in on time?? My water horse and I go for a swim! (I swear Anjo is half hippo. She loves to submerge herself in the water.) Also pictured is Janelle on David the Dunderhorse having an anxiety attack (David, not Janelle). Next up - HOUSE OF NIGHT KITTENS! Oh boy! That's so cool. lol. My grandma used to have a horse and I love them to death. They're so cute! Unfortunately we don't have much room for a horse although I've been trying to get my mom to get me one. They're really expensive to keep I hear. They're very relaxing animals. Horses are, indeed, costly in time as well as money. Like Lenobia says, they're not big dogs. But I was raised with them, so I understand how much work, etc., they entail, and I still think they're worth it. I'd say start with riding lessons and work up from there. I totally agree with what you say! I don't own a horse, but I ride in a club, and I volunteer in an association which prevent them from being slaughtered once they are reformed from the club: two different ways of spending time with these magical and so nice animals when you can't afford to have one on your own; and as you say PC, they're definitely worth it! 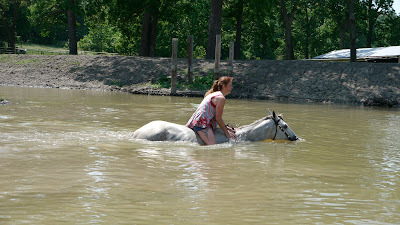 I love to swim with my horse, but there aren't many places around where I live to take her swimming. My horse Angel LOVES the water! Wow,horse riding is beyond awesome!!! Hi, P.C. I was wondering do you or have you ever gotten writers block? I like to call it lose of inspiration. Poet - I deal with the issue of writer's block in my archived post about advice for aspiring authors. Hi PC I'm a huge fan if your books! A few months ago you were selling books that you signed. Unforenatly they were in other languages that I can't read. So I was wondering if you were going to do anything like that again? I know that they were like over stock books so it might not happen but I was just wondering because it would be cool to have your autograph. Thanks for your time! Now that looks like a fun break from writing, speaking of which how many hours a day do you spend writing? Allison - I'll have another charity sale of overstock foreign books probably near the end of the year. I'll announce here on my blog. Shaun - my writing time per day varies between a couple of hours to twelve or more. It just depends on where I am in a manuscript. Right now I'm probably averaging five hours a day writing, which will increase the closer I get to the conclusion. Looks like heaps of fun! What about Big Bonnie, does she like the water too? Hi Ang! Yep, Big Bonnie loves the water! She was there, too. I'll have to remind Seoras to email me the picture of her pawing the water and spraying everyone (Seoras was taking the pictures). a little bit mischievous Big Bonnie? I need to ask when will 'Destined' be released?? ?